What’s new in KOS 3? KLANG:technologies is pleased to announce the release of KOS 3, a major upgrade to its operating system. KOS 3 introduces many new features that provide user benefits and an improved workflow when working with the KLANG 3D in-ear mixing system. A key feature of KOS 3 is the introduction of parametric EQ, providing the equalization of each input signal when no dedicated monitor console is available. Known for its user-friendly operation, KLANG provides a comprehensive range of easily understood pre-sets as well as graphically clear fine tuning with root intensity. 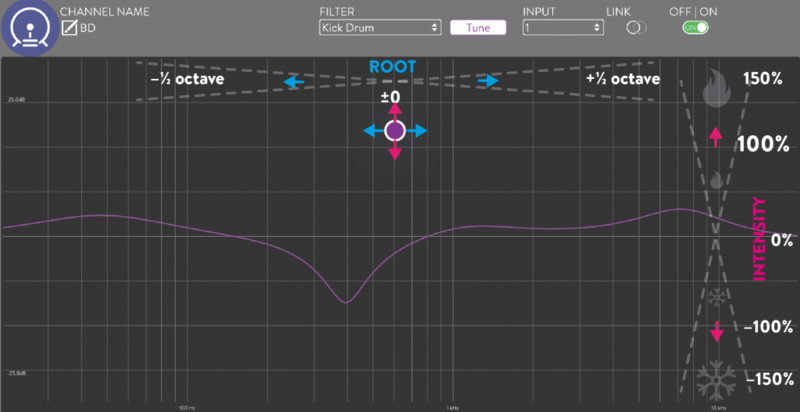 This allows users to gradually blend in the tone signature of the EQ, and even invert it. With just one touch of a finger the pitch of the tonal characteristic can also be adjusted. KOS 3 additionally provides an output mix EQ with pre-sets and output phase invert. KOS 3 also adds an improved set-up workflow. In the detailed Channels Setting View, a channel can be assigned to one of up to six groups, shown with their respective colour and icon. Users can also assign a group colour to all group member channels. 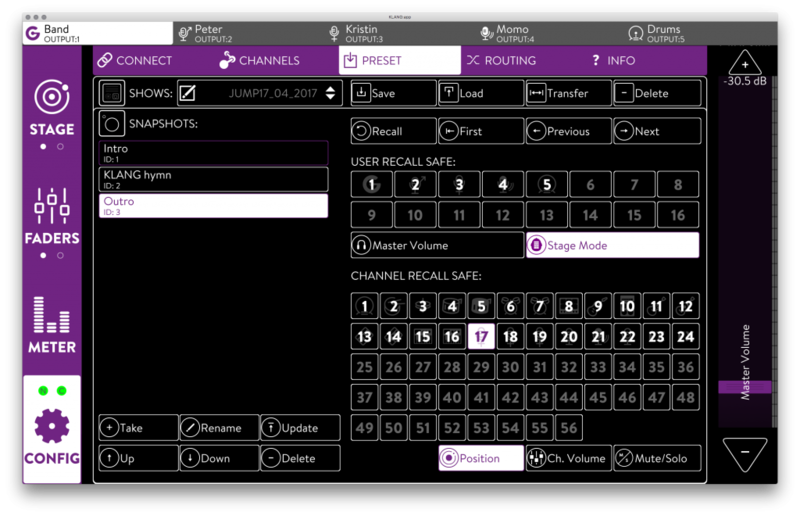 Scene recalls have been significantly enhanced with powerful recall safe options and a new pre-set screen. Further support is included for KLANG:vektor and other direction tracking devices such as the iPad tracker, with a Fix-i3D Button. This provides users the possibility to lock the objects on the outer orbit from spinning and place sound sources more easily, regardless of the orientation of the associated tracker. The new Compact Device List View feature is especially useful if users are working with more than one KLANG device. Immediately it shows how many users are on one device and enables easy switching between them. A Solo-Link in the Stage View means that when channels are soloed in the Fader View, the Stage View will focus those channels like a group. Even in shows with high channel counts, users will find their channel in the orbit immediately. When a channel is soloed, the Clear Solo button right above the master fader makes the user aware of this and lets them disable all solos for that mix in just a push of a button. The new Snapshot Control Everywhere feature means there is no need to switch between menus to recall, fire or save a snapshot. More useful statistics and Pre-set Transfer via FTP are also included in KOS 3. 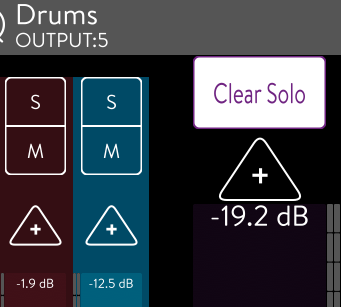 KOS 3.0 was introduced on January 25th at the NAMM show and is now available to download from this link below. Backup all presets on KLANG:fabrik and KLANG:vier. Install KOS 3 with an empty USB drive. Update instructions can be found here. Install or Update your KLANG:app on mobile devices with this link. There are plenty of amazing new features. Some are obvious at first sight and some are not. However, they are all designed to further improve the workflow when working with your 3D in-ear mixing system. We are going through all the features in the following. Especially when no dedicated monitor console is available you want to equalize your input signals. In the channels menu (in Admin mode) you can specify a filter (parametric equalizer with presets) for the input channels. Please note: this EQ is used for the particular input channel for ALL mixes! Go to the Channel Details and choose Tune to fine tune the preset to your needs and see the frequency response. A purple circle lets you fine tune the tonal characteristics. The ROOT parameter is 0 by default. When moved to the left the EQ can be pitched down by 1 octave or pitched up by 1 octave when moved to the right. The INTENSITY parameter is 100% by default. 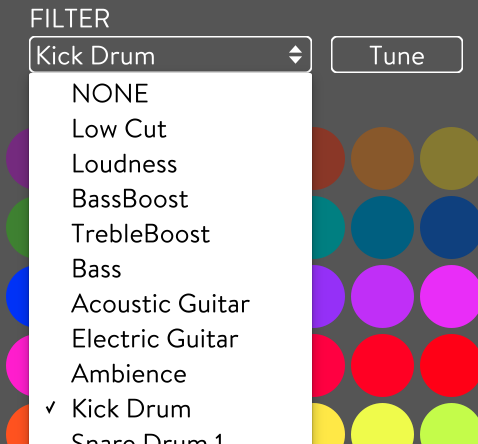 When you move it upwards you can further increase the tonal characteristics of the preset. Slowly moving downward, you will reach 0% resulting in a fairly flat frequency response. By decreasing the intensity further the tonal characteristics of the preset are inverted up to -150%. For each musician’s mix an output EQ is available. Choose from the ASSIGN EQ dropdown in CONFIG -> CONNECT in Admin mode. Flip the polarity of the stereo output signal with “Phase Invert” in CONFIG -> CONNECT. This is particularly useful on loud stages where the bass signal from the PA or the monitors interfers with the in-ear signal. When a channel is soloed the “Clear Solo” button right above the master fader makes you aware of this and let’s you disable all solos for that mix in just a push of a button. 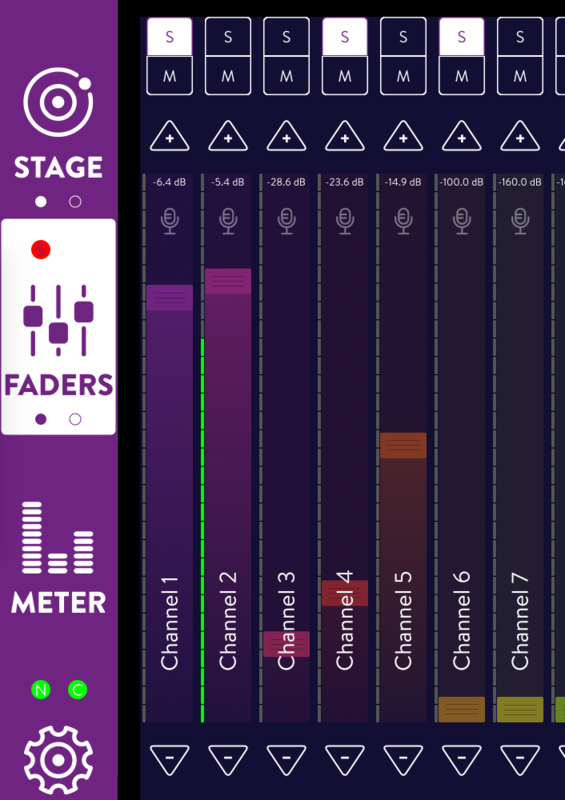 Once channels are soloed in the FADER view the STAGE view will focus those channels like a group. Even in shows with high channel counts you will find your channel in the orbit immediately. In the detailed Channels Setting view you can now assign a channel to one of the six groups. These are shown with their respective color and icon. The channel will be added to the end of the channel list for this particular group. In the detailed group view you will see “Assign Color to Members”. This assigns the group color to all member channels. The preset and snapshot screen has been improved. Icons help to get a clear view what settings are currently applied. Commands for shows have a rectangular border around the icons. These commands are identical to former KOS versions. Icons for snapshots are surrounded by a circle. 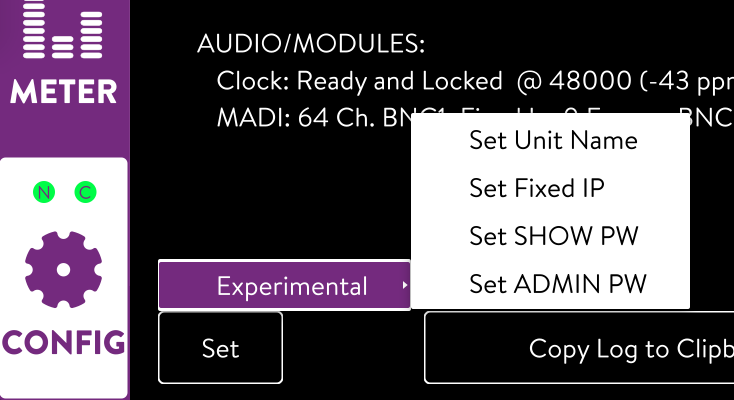 Besides the existing Master Volume and Stage Mode options it is now possible to exclude entire mixes from snapshot commands. This is particularly useful in conjunction with the new personal monitoring mode, i.e. users that mix on their own. Please note: The recall safe options are for snapshot recalls only. A preset recall will always overwrite all settings for all mixes. Now you can exclude individual channels from snapshot recall commands. The channel number is used and the icon of the channel for the current user mix is shown in the back. Please note: Stereo linking does not work with this feature. Hence you have to set both left and right channel to recall safe. Even if you are not using KLANG:vektor but e.g. the iPads tracker, you have now a possibility to lock the objects on the outer orbit from spinning to place sound source more easily regardless of the orientation of the associated tracker. You will love this feature especially if you are working with more than one KLANG device. Immediately see how many users are on one device and switch between them easily. More useful statistics are shown to better indicate things to look at. The Net value shows the network control paket latency. Along with the packet losses a problem, e.g. network loop or misconfigured switch can be found more easily. Please note: this latency does not have to do anything with the audio latency. DSP: DSP missed blocks. Should be zero. If not decrease sample rate or i/o config. EC: Error Counter since Boot. Should be zero, but can eventually show an error. If it increases contact customer service. Click on “Copy Log to Clipboard”. KLANG:fabrik / KLANG:vier will open an FTP read only server on port 21 with the IP address shown in the info screen. Use an FTP programm to connect. On Mac OS X you can connect directly with Finder. In Finder choose Go -> Connect to Server. Enter ftp://<yourFabrikIP>:21 and click Connect. You will see all presets saved on the hardware anc you can copy them to your Mac for Backup. The FTP is read only, so you cannot upload presets to your hardware unit. Go to CONFIG -> info while in Admin mode. Click on the “Set” Button in the bottom left corner. Advanced features for pro users and IT experts only. By default the Unit Name equals the serial number of the device. KLANG:app alphabetically sorts devices based on the unit name. 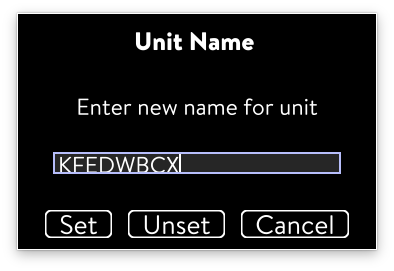 Enter a name and assign it to the unit by clicking on Set. Unset reverts the unit name to the serial number. 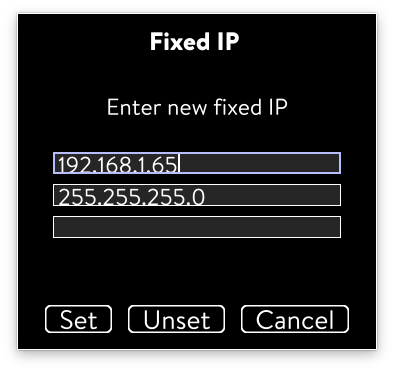 We highly recommend to leave the IP settings to DHCP client only. This will assign a second IP – which is fixed – for KLANG:fabrik / KLANG:vier (not the Dante Module but the 3D in-ear mixing server). The first IP will always stay on DHCP client, so you can access your unit even if you forgot your IP. Please note: if you have an DHCP server running on your network and you want to use fixed IPs make sure that these IPs do not overlap with the ones assigned by the DHCP server. KLANG:fabrik/ KLANG:vier will have 2 IP addresses (+1 for the Dante module). 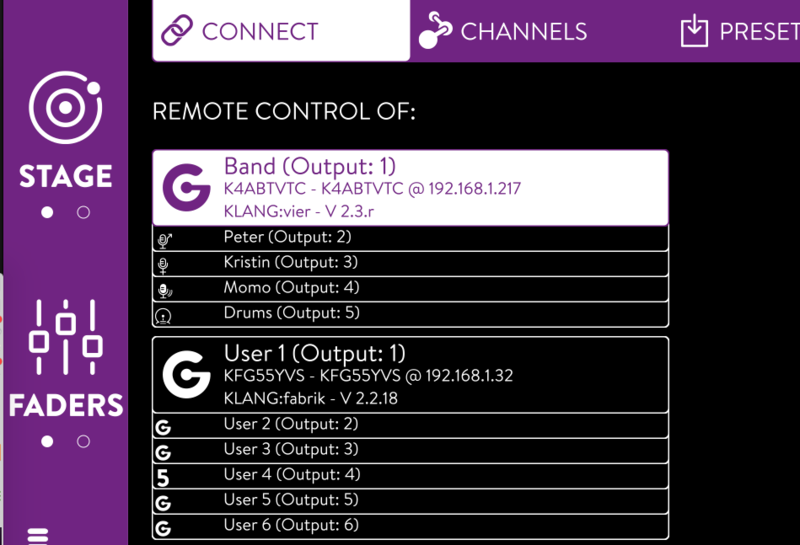 KLANG:app will only show your hardware once in the device list depending on which IP address appears first. Assign a fixed IP in the first line.